We worked with Combi back in November for my sons infant seat! He's still using it now at a little over 6 months old. We also worked with them again this Spring for a stroller to make his car seat a travel system. Again, Still using that! Although now we use it more as a regular stroller than travel system since he's older. 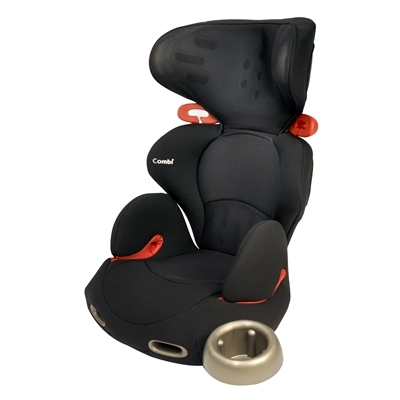 The car seat has been great and safe, so when it was time to move my 7 year old to a booster seat for the first time I immediately went to the Combi site to see what they had. They have the Kobuk booster and it was just perfect for what we needed. The booster is meant for ages 3 and up (however, the later you wait to switch to a booster, the safest your child will be) and 33-125 pounds and 33"-57". My daughter turned 7 in May. She's 45 pounds and about 46" tall. We were going on a vacation and I decided to move my 2.5 year old forward facing and my 7 year old to a booster in the 3rd row to leave the captains chair stowed for more room. This way I could get back there and change diapers and disperse food on our long trip and stay out of rain if it was raining. So it was time to move my daughter to a booster. Her current seat is a harnessed booster, but it's expiring soon so it's time for a new one anyway! When I came across the Kobuk I just loved how it looked! The seat is a backed OR backless booster, so it's designed to grow with your child. It has a removable cup holder as well as removable and washable cover. It features deep side walls with Tru-Safe Side Impact Protection to the head, neck and torso, head restraint can be easily adjusted for a more comfortable fit. It has belt guides to make the seat fit well. The ones on the wings are for the shoulder belt and the lap belt goes under the arm rests. It helps to make sure the belt fits properly every time with no room for errors. Can be a high back or back less booster and comes with a cup holder. The air flow is so nice on this booster. SO nice! And that's a whole layer of foam under there. To make it a high back booster, lay both pieces flat and then put the back on the seat and push down. when that's done, just pull up on the back until it locks in place. To convert back to a backless just pop the back down and unhook it. Handle on the back to raise the head rest. The belt shoulder belt positioners should be at or above shoulder level. My 7 year old in the seat. She's 45 pounds and about 47" tall. My daughter said the seat was super comfortable for our long trip. We drove about 12 hours the first day and then 4 the next day, then 4 a few days later, then another 4 and then finally 12 back home. She was plenty comfy and never complained once. Even though it was her first time using the seat and she wasn't used to a seat belt yet. She said it was very comfortable. We couldn't put in the cup holder because of the seat set up. On one side it would interfere with my toddlers seat and on the other side it would hit the side of my car, but she has 2 cupholders there anyway. The seat only weighs 12 pounds, so it's super light and perfect for moving between vehicles. I'm so glad to have 1 child out of a car seat now. Perfect for when grandma or grandpa want to take her for the weekend. And super easy to move around.